It's important to think ahead and plan for tomorrow, but an artist must also be in the moment...the now. 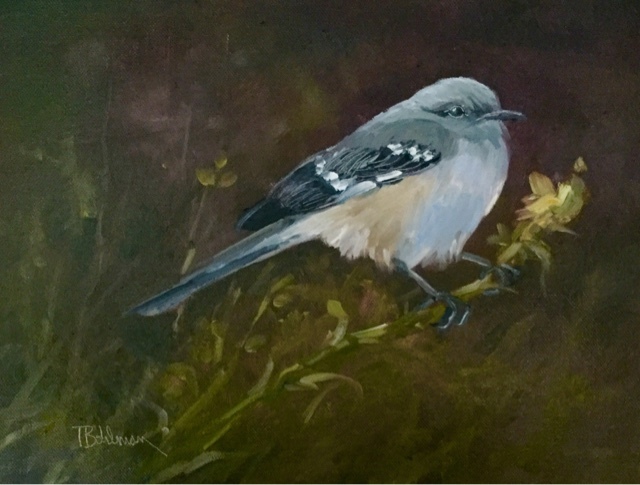 The past week or so I have revisited a subject matter that I really enjoyed....songbirds. These three were a delight to paint and I'm excited to get started on the next "portrait"....mom & pop Cardinal. These paintings and others are available for purchase. Visit my website to see my portfolio. Sometimes I forget that my best source for a new painting is probably laying around in my studio - I often paint small watercolors or oils then set them aside to begin another project. The Red Barn painted with fall colors in watercolor was my source for another Red Barn in spring colors - this time in oil. They're both similar, but very different because (a) different medium and (b) different seasons. Each has it's own beauty; the top is the watercolor - the bottom is the oil. If I had to choose a favorite, I don't think I could. What about you? Since my last entry to this blog, I've been rather busy with events as well as time in the studio.....and as a result of events & studio time, I produced new and exciting work that won awards in 3 separate events. The Kerrville Outdoor Painting Event is one of my favorite plein air events and this year was especially fun - I won 2nd place with my watercolor "Welcome Home"! "Welcome Home" was the 1st one I painted (and my personal favorite) upon arriving in Kerrville and I'm honored that show judge, Rusty Jones liked it too! The dirt & gravel road leading up to this historic farmhouse was picture perfect - no problem with making a good composition here; a no-brainer for sure! The 45th Annual Women Artists of the West exhibition was in Tucson, Arizona this year and juror Carol Swinney gave my entry "Rainbow Row" an award of Excellence! The inspiration for Rainbow Row is from a fuzzy photo taken years ago from a tour-bus window doing 40 mph through a village in Belize. This painting also sold at the show - I'm happy and sad at the same time - happy it sold (yay! ), but sad I didn't get much time to enjoy this one; it went straight from the studio to the exhibition. Last month, my painting "Scouting for a home" won Best in Wildlife award at the Campfire Texas annual Gala, An Artist's Christmas. "Scouting for a home" - 8x10 Egg Tempera (sold). This is a medium that I work in occasionally - it's rather "tedious" in that it takes layer upon layer of transparent color. The Masters used dry pigment (ground very fine), mixed with the binder of pure egg yolk and water. To achieve best results, it must be mixed in the right ratio of pigment to egg binder. Today, artists have the advantage of a "short cut" - the medium is pre-mixed and available in tubes from art suppliers. Years ago, I painted a lot waterfowl and songbirds - this one was a favorite. This fall in the studio, I had 2 paintings going at the same time - Waiting for the Crew and Autumn's Overture. Autumn's Overture - 24x30 Oil on Gallery Wrap Canvas. I often work on 2 paintings at the same time in the studio and sometimes with different mediums. Oil and watercolor are direct opposites in technique and medium - which for many painters creates a "brain warp"! For me, it serves to keep me focused. With 2 paintings in process, I'm also less inclined to overwork a painting. I'm currently working on a Christmas commission - it's a gift from a mother to a daughter & I'll share that in a later post. In retrospect, 2015 has been a wonderful and exciting year for me and I can hardly wait for 2016 to get started - it's shaping up into another great year too! I'll be spending a lot of time in the studio during the winter months of January and February. March and April promise to be busy with workshops, demonstrations and...events (YES!). In the meanwhile, my best wishes for a wonderful holiday season and I'll see you next year! Competition + Camaraderie = Creativity! 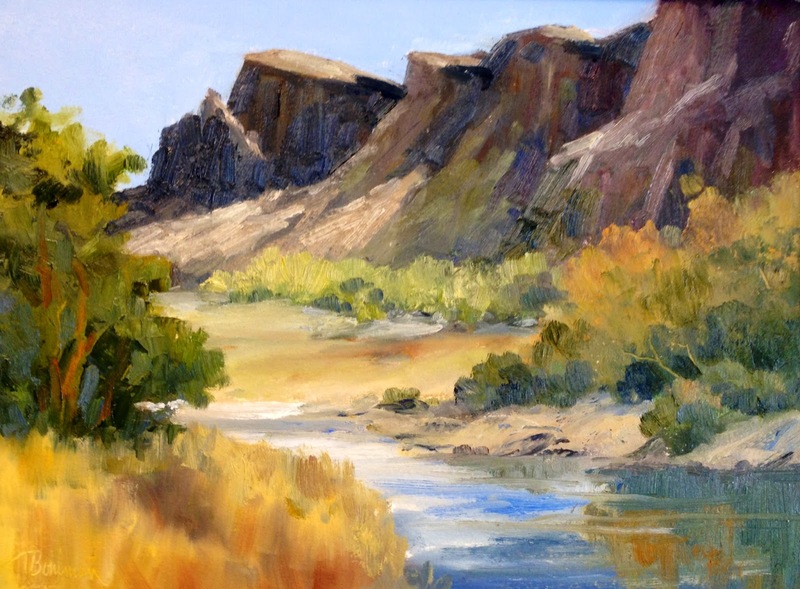 Event #1 - April 2015: The Outdoor Painters Society's juried membership show "Plein Air Southwest Salon" hosted by Southwest Gallery in Dallas. This annual event presents plein air paintings completed in the previous calendar year. OPS members submit up to 3 entries to a jury panel. On average, more than 300 paintings are submitted with the jury accepting around 200. Accepted artists compete for $20,000 in cash and merchandise awards. The juror this year was Phil Starke of Arizona - great talent and a good eye for excellence. I had 4 paintings in the show - didn't win an award, but just being a part of the event was award enough for me. 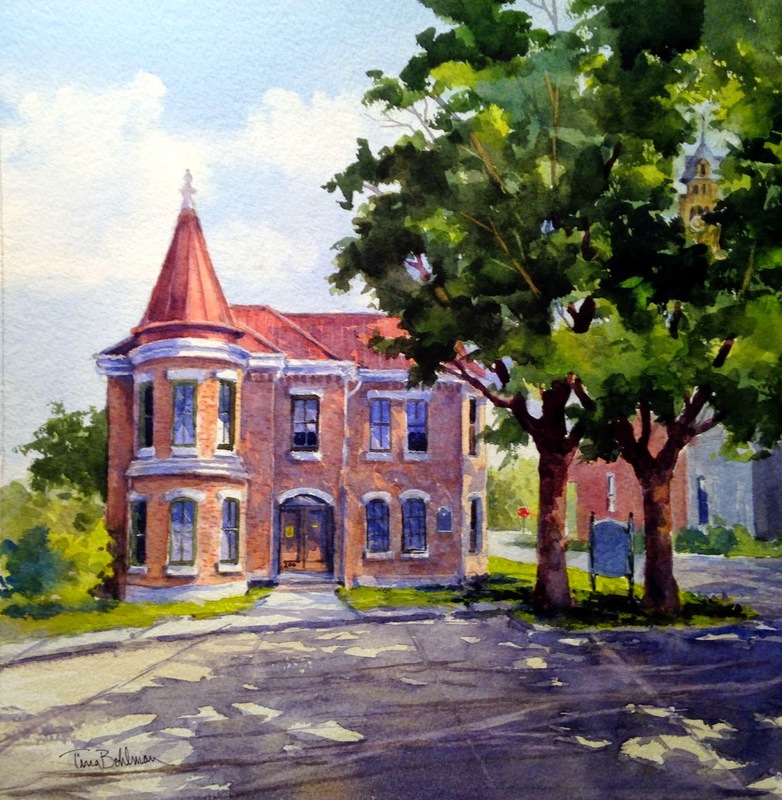 Event #2 - June 2015: Paint Historic Waxahachie - This tenth annual paint out event is open to any artist working in the plein air tradition. I'm the organizer of this event so I "wear 2 hats"; I'm "event staff" AND a participant. One of my paintings was awarded 2 place by this year's juror, Deborah Paris. 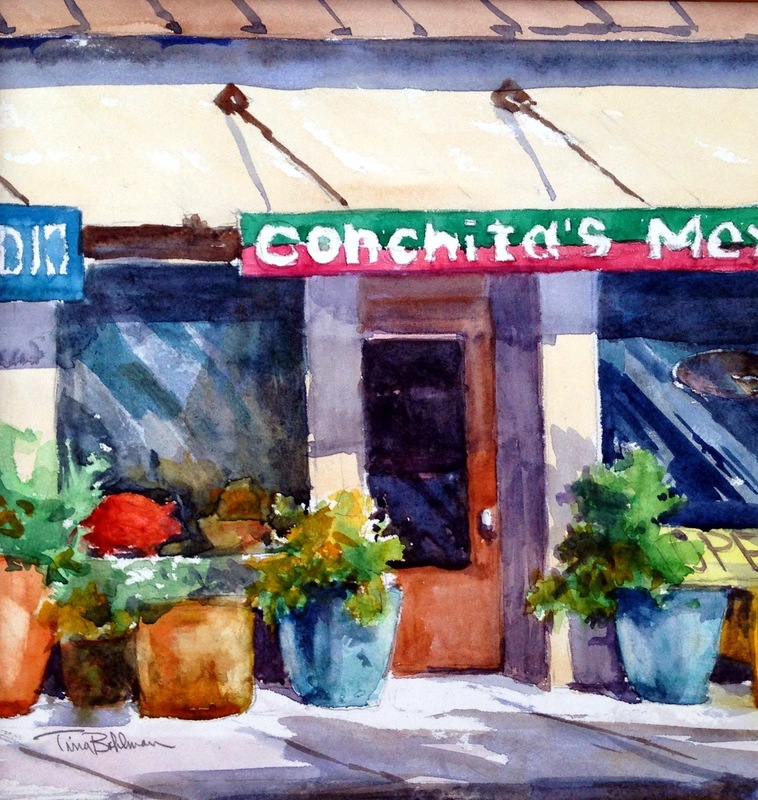 Event #3 - July 2015: Plein Air Easton - this event is rated as the #1 plein air competition in the nation. I was honored to be one of only 58 artists selected to participate in the 10 day paint out event. I loaded up my little Kia SUV and drove 1400 miles to Easton, Maryland - on the eastern shore across the Chesapeake Bay from Washingto0n DC. It took me 2 days - 22 hours - to get there. The result of the events: Re-acquainted with artists I haven't seen in a while, met and became friends with artists whose work I've followed and admired, and - best of all - produced 20 new paintings. Competing against the best painters in plein air events is exhausting, frustrating, exhilarating, .......and productive. I probably do my best work in competition situations and get into a "creative zone". What fuels my creativity is being surrounded by really talented professionals that are an inspiration to me. Competition events aren't for everyone - and it's perfectly alright if an artist doesn't want to participate. They travel their own creative path with other painters of like minds who simply enjoy painting outdoors. Absolutely nothing wrong about that! 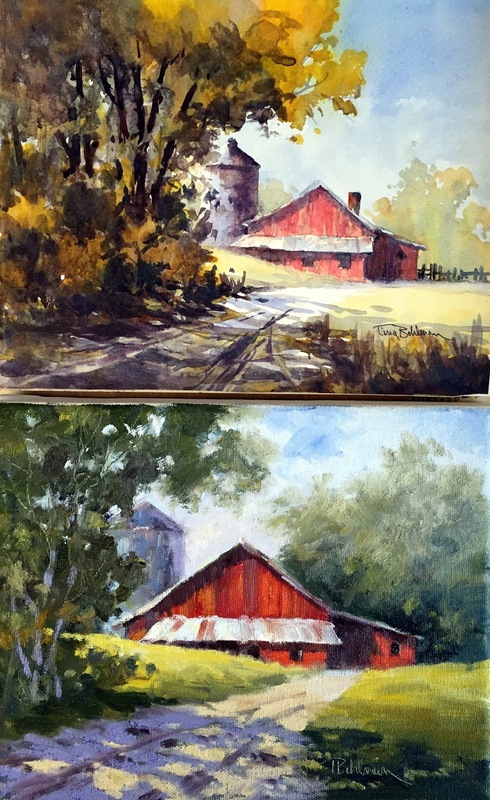 These paintings and many others are in my Plein Air Gallery on my website - check them out! I spent the last 6 weeks of 2014 completing commissions that were for giving at Christmas. 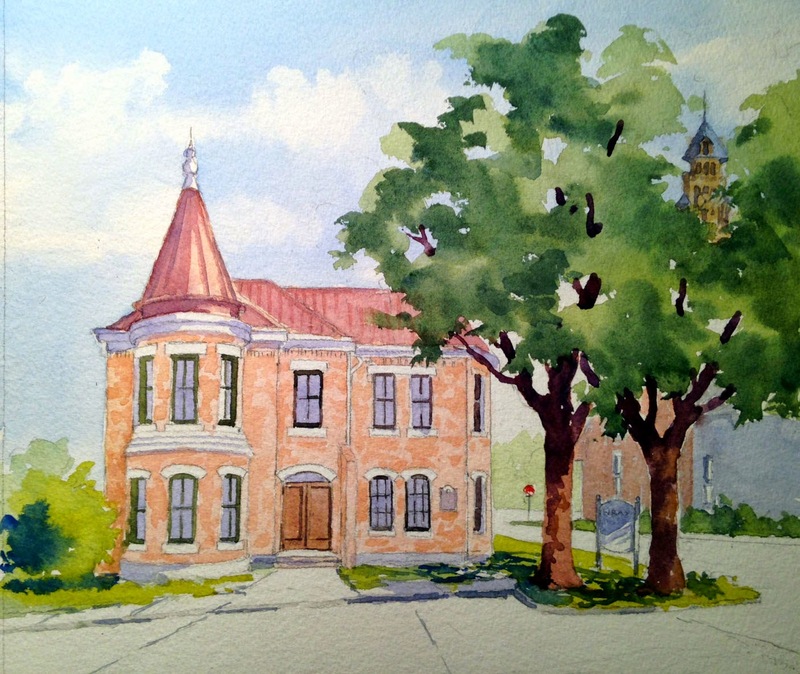 The most challenging of my commissions is The Old Jail in Waxahachie - a beautifully restored building that is now privately owned by a law firm. The following images are brief documentations of 3 stages of completion. 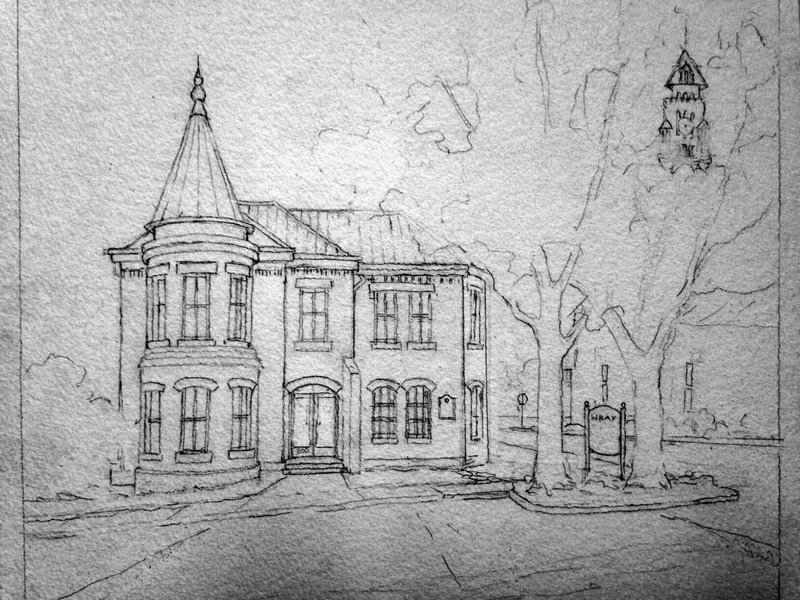 This is the final drawing of the building. With watercolor, the artist does not have the luxury of being able to "wipe off" mistakes or paint over a passage to make any changes. 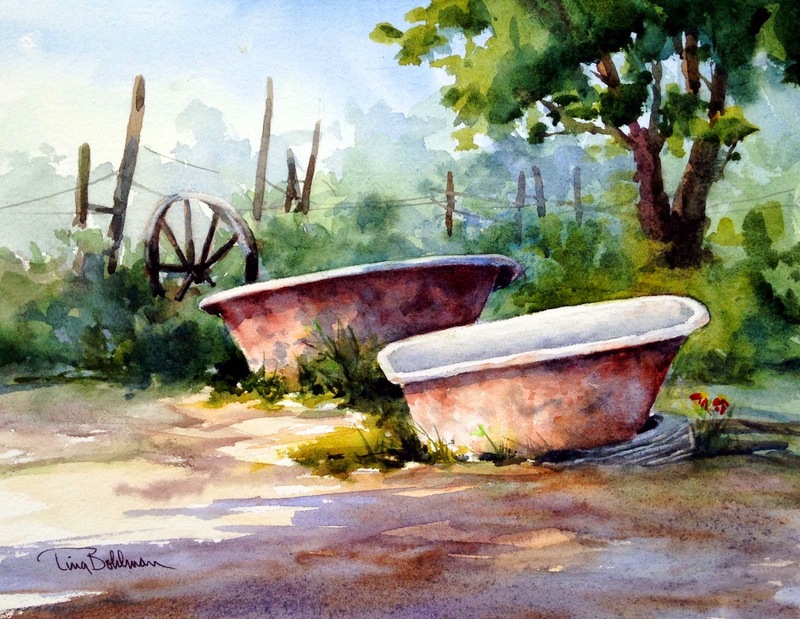 An experienced watercolorist can make minor changes but for the most part, once a stroke of paint is applied, it's difficult to change after it dries. At the onset, the original drawing is critical and requires a lot of "adjustments" in the process - erasing & re-drawing. I use tracing paper because it erases easily and if I decide to completely change the composition, I can trace parts of the drawing I want to keep onto a new sheet of paper. After I completed the drawing, I transferred it onto a sheet of 300 lb. Arches watercolor paper. To make the transfer, I use a "wax-free" graphite paper - an artist's "carbon paper". I place the graphite sheet between the watercolor paper and the drawing (on the tracing paper), then tape the tracing paper drawing in 2 or 3 places to keep it from "shifting" during the transfer process. In the above photo, you can see my photo reference displayed on a 22" computer monitor. I refer to the photo reference during the painting process mainly for accuracy of color and building details. 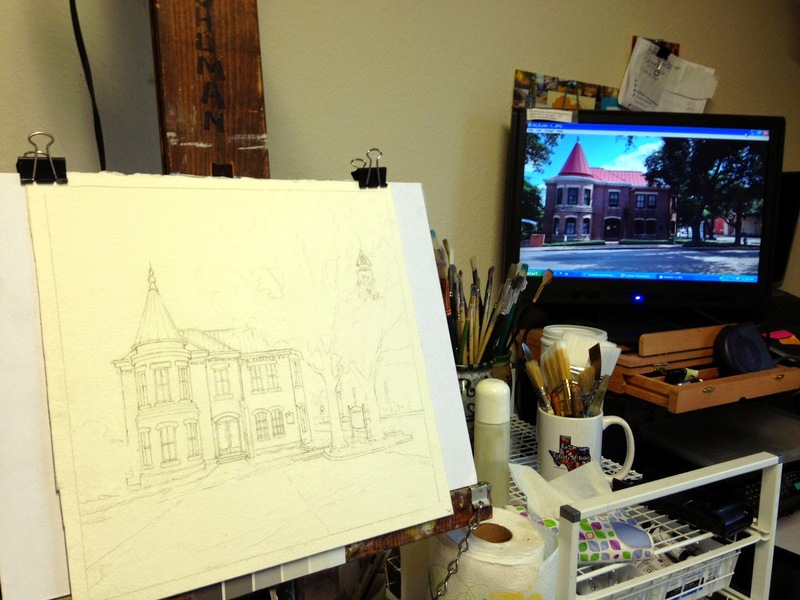 This photo shows the initial layer of color; I painted the sky first then base colors of the brick & roof. and established the shape of the trees, adding the top of the courthouse "peeking" through. (the courthouse is actually a block away). From this point on, through to completion, I work all areas of the painting independently. The above photo is the completed painting. By comparing it to the previous image, you can see that I deepened values as much as 50 to 75% more in areas to offset the light values in the trees, building, and shadows. The only area remaining untouched from the very beginning is the sky. 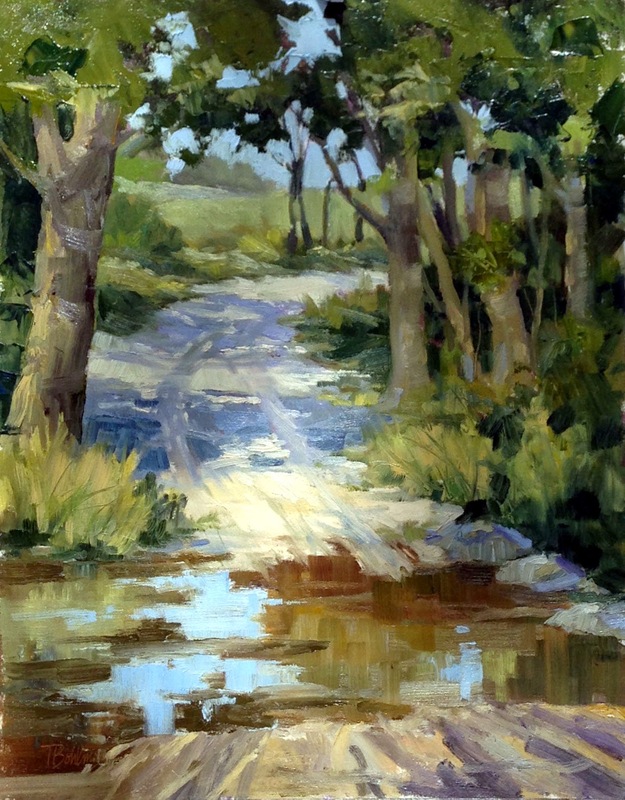 Throughout the painting, laying in washes of stronger values suggesting a light source of sunshine in a bright blue Texas sky. I delivered the painting to my client a few days before Christmas...and she said it was perfect...especially with the little "surprise" of the courthouse peeking through the trees. I love my job! October has always been a busy month for me and 2014 was no exception. October 1st through 4th, I participated in the Kerrville (TX) Outdoor Painting Event. I truly enjoy participating in KOPE; the scenery in and around Kerrville is magnificent. Another reason I enjoy it is because I have a cousin living only 10 miles from the event and I get to spend time with her & her husband too. The show is always a good one for me as far as sales and this year I not only sold well, but I won an honorable mention as well. and they were very generous with their pocketbooks. The juror of awards, Steve Doherty, Editor of Plein Air Magazine, awarded my painting "Low Water Crossing" with 3rd place honors! This past Spring I visited Big Bend National Park with the sole intent to create as many "color studies" as I could. In the 5 days there, I spent almost as much time driving (it's a really BIG park!) as I did painting. One never knows what kind of weather conditions will be encountered but out of all the trips I've made to this magnificent remote corner of West Texas, the weather while I was there was perfect; clear skies, no wind, 80 degrees.....a plein air painter can't ask for much more than that! This location is along the Rio Grande north of Terlingua, Texas at a tourist attraction known as the Contrabando Move Set. This is looking easterly with the sun about 10 o'clock high which created a "back lit" view of the cliffs across the river on the Mexico side. I want to share the "before & after" of this painting. I rarely make any adjustments until I can get it back into the studio....and upon review back in the studio, I seldom make any changes; the purpose for working on location is to record accurate color, values and capture the "atmosphere". So, having said all that, the first image ("Before") is without any adjustments in color, value or composition changes. Very often, when looking "into the sun" for 2 hours, it literally makes you unable to "see". 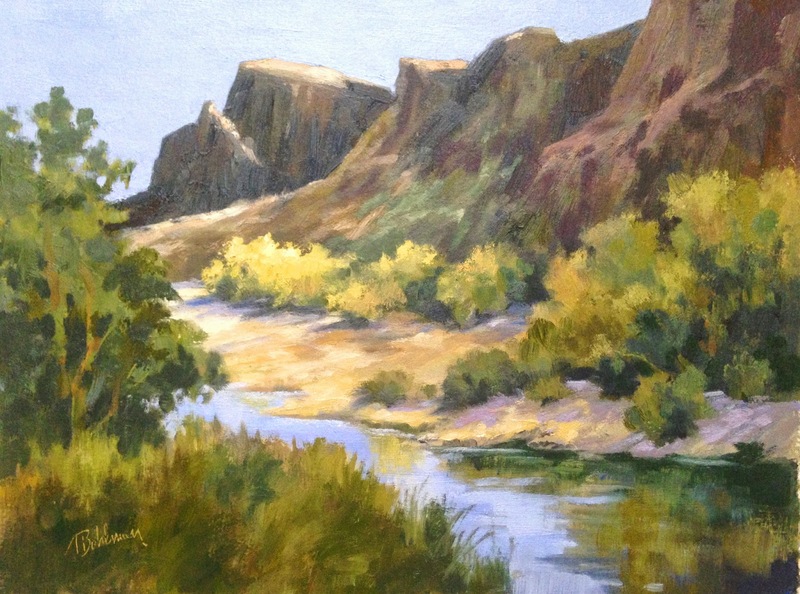 "Up River View - The Rio Grande"
In the studio I could see where adjustments were needed in value as well as intensity of color. The cliffs in the "before" image were too strong in color as well as value so I "grayed" the color to soften them. Changing the cliffs made it necessary to rework the foreground a little by muting the colors to a darker value and raising the value in the mid-distance so the willows appear to be in full sun. I also changed the tree color in right foreground to be less "orange" and set them more in shadow. I'm still not sure I'm finished with this one, but it's getting there. I'll set it aside for a few days then look at it again with "fresh eyes". I think this painting could be my reference for a larger studio piece....we'll see! Enter email address to get new posts delivered to your inbox! I'm a full time artist; native Texan, self taught and work primarily in the medium of watercolor. 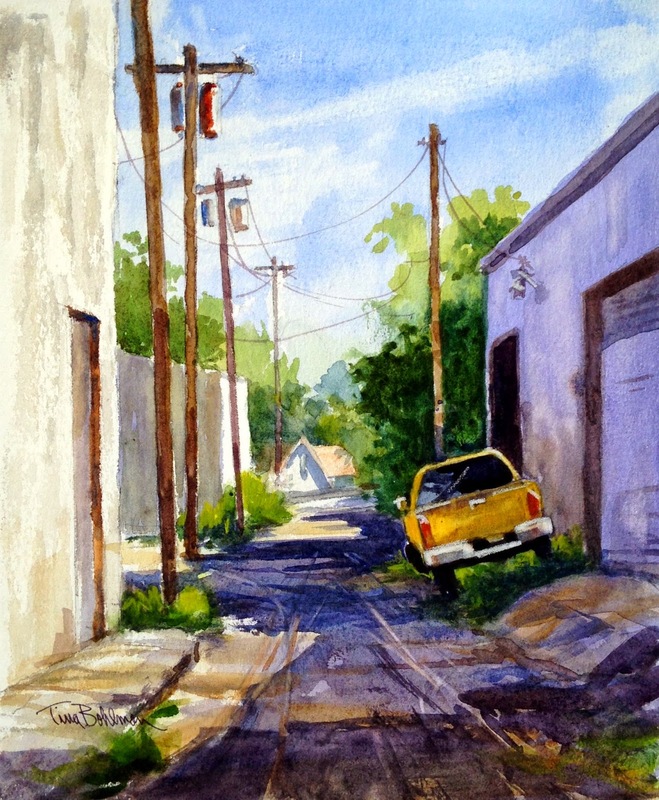 Painting daily, I prefer to work en plein aire (on location), and I'm often seen working in the historic districts of Waxahachie and throughout the North Texas area. 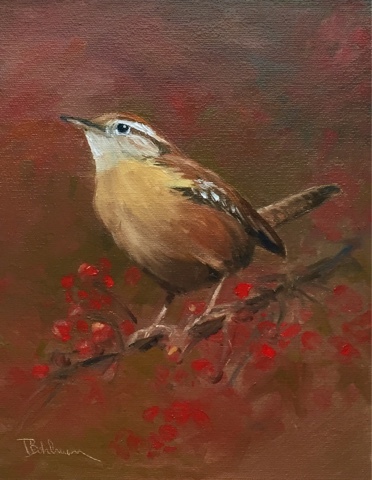 A member of several arts organizations including Outdoor Painters Society (Signature Member), Contemporary Fine Art International (Signature Member), Artists of Texas, Professional Artists in North Texas, International Plein Air Painters, Landscape Artists International,DeSoto Art League and Ellis County Art Association. 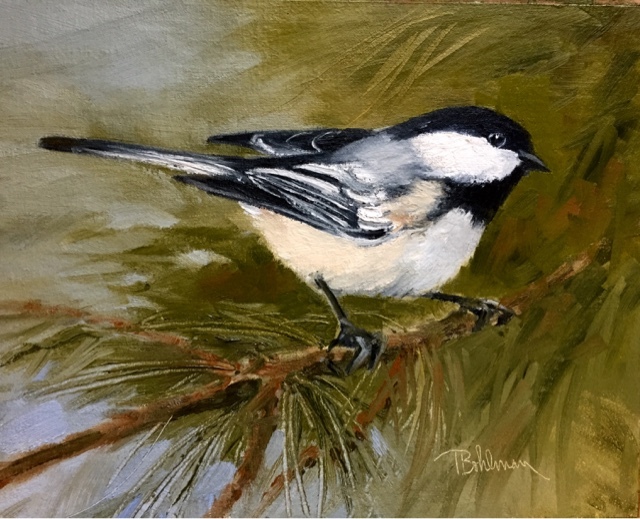 Painting professionally for over 35 years, my originals are in private and corporate collections in 34 States, as well as Mexico, Canada, Australia, New Zealand, United Kingdom, Scotland, Portugal, Germany, and Republic of Benin, West Africa. Hosting the Annual International Worldwide Paint Out and the World Tour of Contemporary Landscape Painters.